Theatre: A Hero Returns to Britain! Before Obama in the White House, before the Civil Rights Movement, Martin Luther King, Malcolm X, Nkrumah, Bob Marley and Mandela; before African and Caribbean independence, there was Paul Robeson. It’s probably difficult now to imagine what the mid 20th century was like for many people of African descent around the globe. This was the age in which African-American legend Paul Robeson (1898-1976), was at the height of his fame. Robeson, the son of a preacher, fell in love with books and the spoken word very early in life. His parents also taught him to be proud of being Black and to stand up for others and what he believed in. To many at the time, Robeson was not only the former All-American college athlete, he was also the world-renowned handsome Shakespearean actor and singer. But he lived in an era in US history when crude racist stereotypes and contempt for people of African descent were underpinned by hard-line segregation policy that was the Jim Crow laws. Robeson was at this period the most famous Black man in the world - alongside Marcus Garvey. He used his privileged position to demand human rights for Black people in the United States long before it became acceptable or safe to do so. The supremely talented scholar, athlete, musician and classical actor refuted by his very presence the then prevalent notions of white supremacy and African inferiority. He also took a courageous stance against emerging fascism in Europe and untiringly championed the cause of African independence and world peace. But as Robeson’s popularity was rising, so was McCarthyism (late 1940s to the 1950s) – a political witch-hunt of supposedly communist sympathizers led by the congressman Joe McCarthy. And because Robeson had friends in Russia and was in favour of anti-lynching laws and the liberalization of colonized peoples in Africa and elsewhere, he was denounced, marginalised, prevented from earning a living and virtually put under house-arrest. Despite this vilification, he never once renounced his beliefs and when his passport was returned to him in the late 1950s he again toured the world, where his popularity was reignited. Until his death he was beset by health problems; caused – according to persistent speculation - by drugs and electro shock treatment administered for mental health problems triggered by the harassment he had endured. Where Robeson’s story could be seen as tragic – indeed the US government sponsored campaign intended to neutralise opposition in this way – Tayo Aluko’s energising portrayal not only depicts a determined and courageous man, but also a vulnerable and sensitive one. On a sparse but effective Theatro Technis’ set that was designed by Phil Newman, and with Michael Conliffe’s piano, Aluko gives us a good portrayal of Robeson’s life and career - a Union Jack and flags of the United States, Wales, and USSR – denote countries with which the artist had a deep affinity. Robeson, as Aluko shows, enjoyed a rapid ascent to the top in the 1920s and 30s: not merely for his remarkable singing voice, but for his stage performances in Showboat, Othello and The Emperor Jones. Elegantly guiding the narrative on the ground level stage, Olusola Oyeleye’s thoughtful direction recalls Robeson’s famous stage performances and speeches with the same sensitivity as the more poignant episodes in his eventful life. Although Robeson was a true heavyweight at 6‘ 4‘’ and 220 plus pounds - with a deep bass voice to match, Aluko, an established architect in Liverpool, who is also the son of the late Nigerian literary giant T.M Aluko, makes the most of his own middleweight stature; his expressive and effortless baritone perfectly convey the determination, courage and willpower of Robeson. 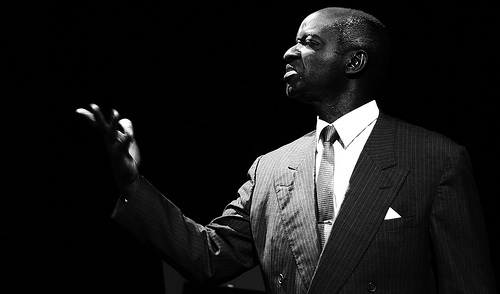 The core of Robeson’s popularity was his inspiring and passionate songs, and Aluko does these qualities justice with his sensitive and powerful acting. The signature tune Ol’ Man River, rousing Ballad for Americans and the evocative spiritual Battle of Jericho stand out amongst several performed on the night. This is a big story to condense into a 75 minute theatrical event. And the challenge is accepted with style and skill by writer and performer Tayo Aluko, Director Olusola Oyeleye and Designer Phil Newman. And the national and international tours which the show has already completed give it an effortless quality, already acclaimed by several awards. Through Aluko’s performance, Robeson indeed Lives On!